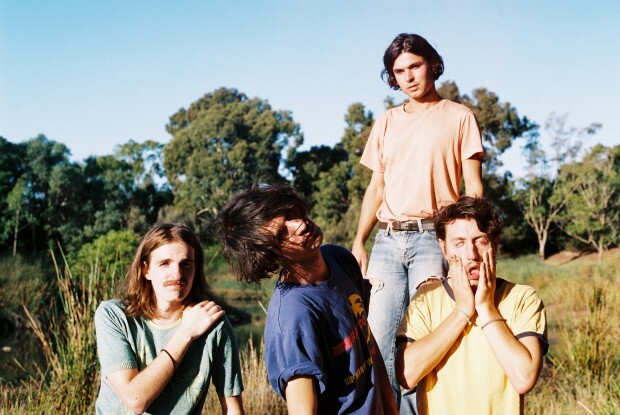 The legends were feelin’ the summer vibes at Courthouse Youth Arts, so decided to throw a FREE music festival showcasing some of Geelong and Melbourne’s finest acts as a gift to music lovers in town. Kicking off from 12pm on Saturday 2 February, you’ll find some free tunes from a range of indie, folk, hip hop and soul acts, with performances from Demi Monique, Noah Vernon, Manny Lado, Naked Meadow and Hobsons Bay Coast Guard. Please note this is a drug and alcohol free event proudly supported by FReeZA. We chat to headliner’s Hobsons Bay Coast Guard ahead of the festival. Hey thanks for chatting to Forte Mag! How are you and what have you been up to recently? Hi! No worries at all. A range of different stuff: Erik’s been brushing up on his chess (Magnus Carlson youtube analysis 24/7); Zac’s been brushing up on his midsummer tan; Jack’s been practicing his death metal double kick (strictly against Hobsons rules but we’ll let it slide this time) and Chris is one swipe away from a full wax off. First up, can you give our readers a quick intro to the band and how you guys came to be? Short answer: We’ve been friends a long time and music is the marrow in our collective bones if ya know what I mean. Your music is a pretty unique blend of surf-psyche and pop; what are some of your main influences when creating music? We hear you guys have a full-length album (your Facebook actually said two) ready to go this year – can you give us any insights into what we can expect, and maybe when we might expect it? Yes! Correct! Exactly! Mum’s the word in terms of a release date but we can definitely confirm that it will be VERY SOON. As for the second album (Pet Sounds 3™) its almost done so our main obstacle from here is just all the different coloured industry tape we have to cut (as usual). How’s the creating process go for you guys – is it a collaborative effort? Definitely. It’s pretty standard process but we like to write music at home individually and then see what the band can bubble up and scribble down in rehearsal. Every now and again we’re all together and there’s this rare flash of brilliance and something great gets created on the spot – like a gift from the cosmos. But most of the time we’re just having naps and doing rap battles. The name, we are thinking you guys have ties to Hobson’s Bay? Were any of you coast guard’s pre-music? Yeah most of us grew up around that area. It’s lovely. As for the second part we’d like put on record that we have no affiliations with the military. You’re headlining the free Summer Laneway fest in Geelong this February. Have you ever performed in Geelong before? What are you going to be bringing to the laneway fest? Pretty excited for this one! We love Freeza. They do a lot of great stuff for young musicians all over the country (and a lot for us when we just little babies with guitars) so pumped to be playing one of their events. Also we’re popping our G-town cherry for this gig. Should be a melter! You’ve also just been announced for Grampians Music Festival and By The Meadow festival later this year. Do you guys enjoy playing these types of festivals, or do you prefer to play venues? Will we be seeing your names on a few more lineups this year? Festivals are great and venues are great! Very different vibes but we just love playing so wherever and whenever is our speed. Do you guys have any crazy or weird pre-show (or post-show) rituals? If we haven’t whipped out the ol’ Oujia board or rolling the sheep knuckles for some mystic predictions you’ll probably find us in a circle giving trust falls. We know music is ever-evolving. For you guys, have you given your hearts to vinyl, CD or online streaming, and why? Honestly music is our favourite thing however it’s packaged so we’d have to say everything! Streaming services (despite the low priority they put on artists’ income) has opened up a universe of music for so many people which is a beautiful thing. And vinyl is cool if you want a nice physical embodiment of your faves. I don’t think I’ve seen a CD since 2008. What’s next for you guys in 2019? We’re hoping to move fast and have another album out by the end of year. We got a lot of ideas so we wanna keep moving as fast as possible. Expect a lot of shows though!